The 20th Anniversary Countdown has ended! With the end of the countdown we get TONS of new (and further fleshed out) details about the 20th Anniversary V-Pet. 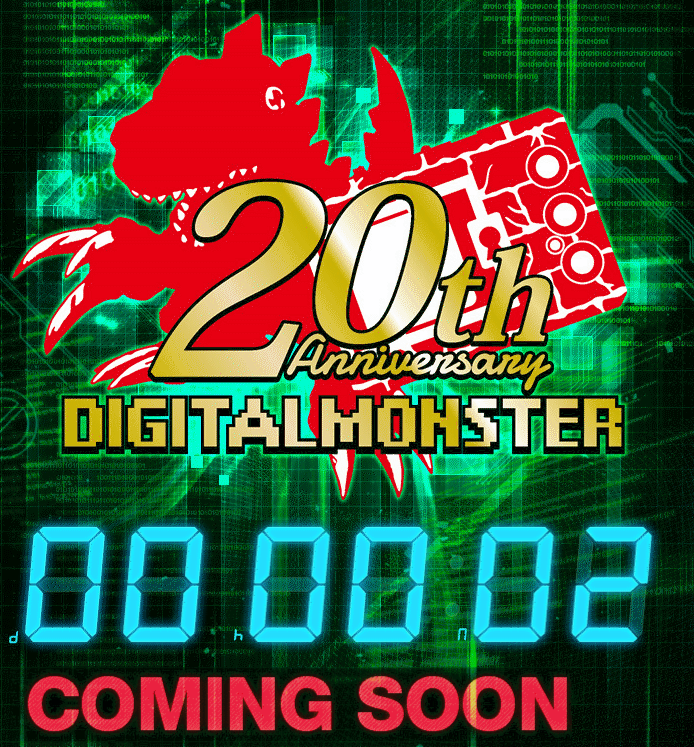 Along with that we also get information about the new Digimon made for the 20th Anniversary! Zubamon carries the ”Twentiest” data and often shouts out that “I am the Twentiest! !” without really understanding what it means. Its personality is such that it despises twistedness/crookedness, and is constantly seeking sharpness. A day where its battles and jokes go well and its sharpness feels good will leave it in high spirits. Zubamon will charge from the start using it’s technique “Twenty Dive” where it’s power to turn into the form of a weapon is on full display. His evolutionary line will be updated at a later date! 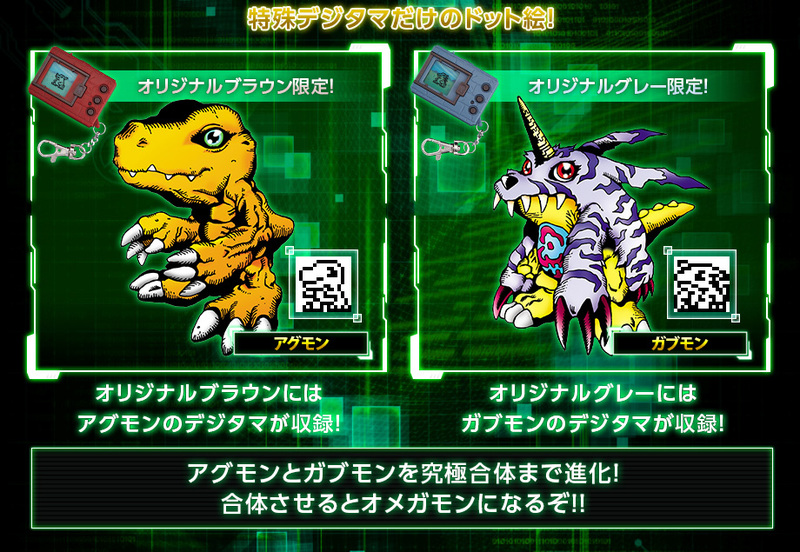 Brown will have Agumon's digiegg and blue will have Gabumon's digiegg. Both of these have full evolution lines including Omegamon. They then have a section about evolution. 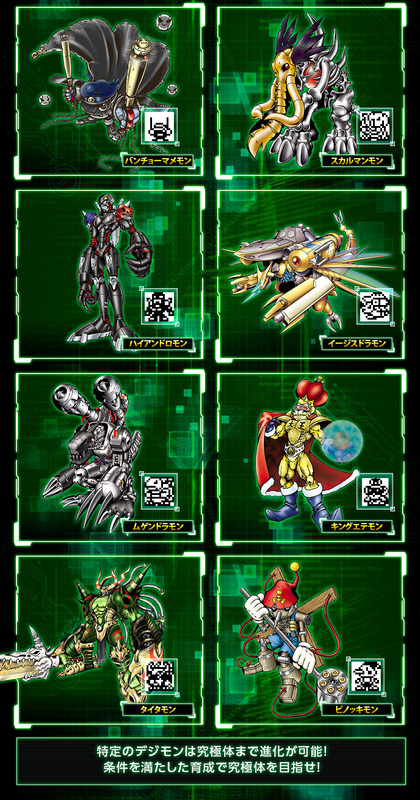 BanchoMamemon, SkullMammon, HiAndromon, Aegisdramon, KingEtemon, Mugendramon, Titamon, Pinocchimon. Specific Digimon will be able to evolve to Perfect! And of course, beyond that to Ultimate. You'll need to fuse! They push you to aim for the strongest Digimon! 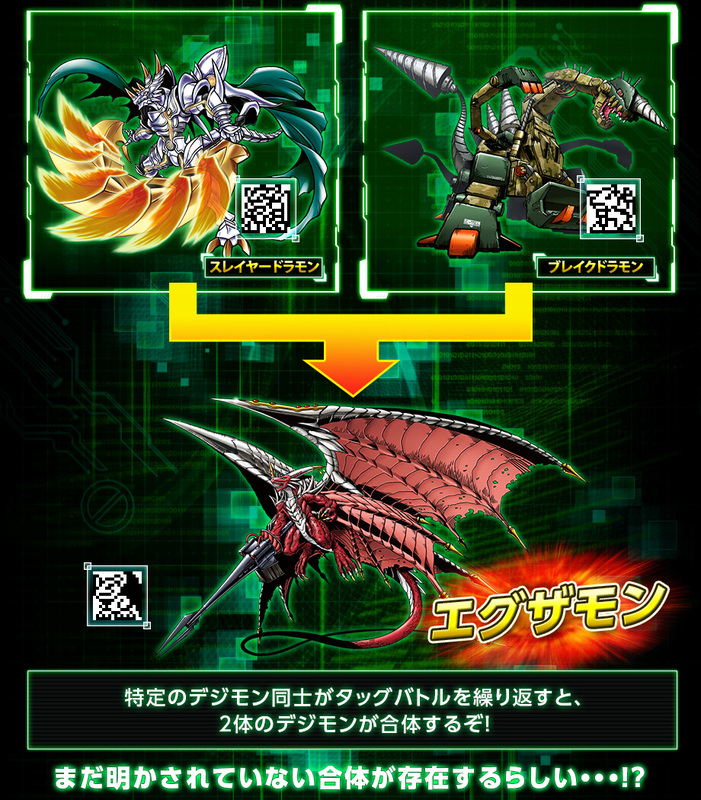 If you continue to use Slayerdramon and Breakdramon in tag battles they will be able to fuse into Examon! "And there is a fusion that exists that has not yet been revealed?!" Next they bring up a bunch about raising your Digimon. You'll be hatching eggs from v1 thru v5. The Digimon will eat together, sleep together, and, of course, poop together. A more timely life cycle. 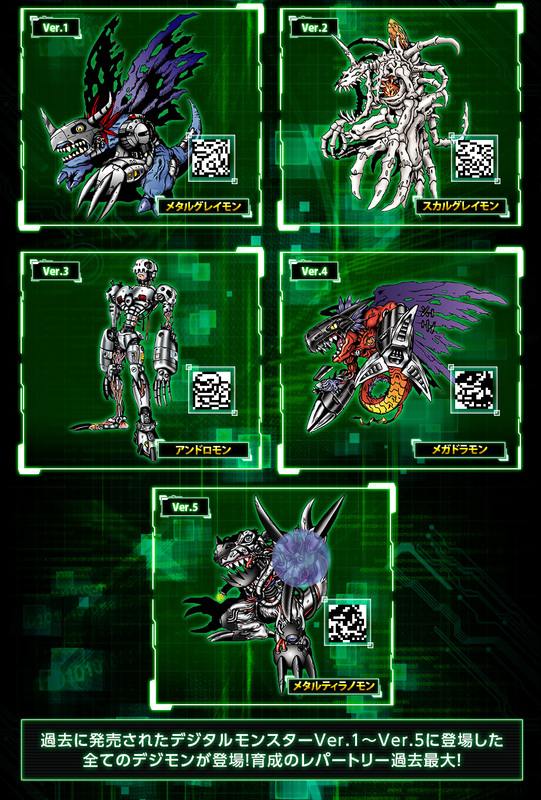 Not just adding the Ultimate Digimon to the game, they've redone the life cycle period entirely. The entire Digimon life cycle is now 2 days. It took that long for Baby 2 in the original! It should make raising much more fun and dynamic. Then we get quite a few details on battles and connections. Two Digimon can tag battle together! Two gauges control the battle. The left is timing, the right is intensity. The two of these affects your attack power! When you've been attacked, you can rotate in other Digimon. This lets you join forces to defeat the enemy! You can Tag Battle with your friends! You can also battle against a copy of your friend’s Digimon when you link up to their 20th V-Pet. Endurance Mode! 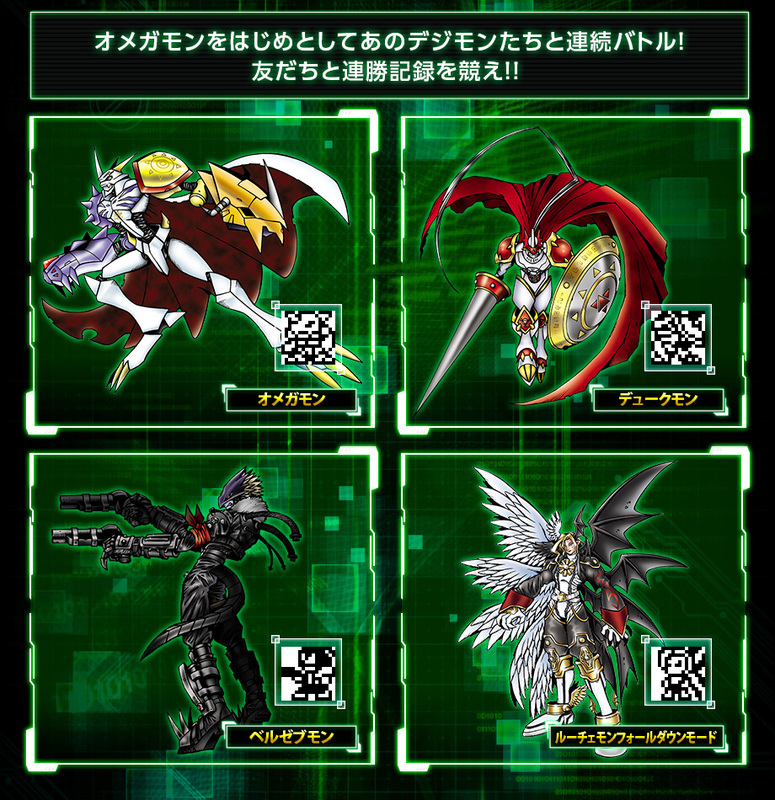 You'll do consecutive battles against Omegamon, Dukemon, Beelzebumon, and Lucemon Falldown Mode. They aren't teasing additional Digimon for this mode, nor do they specifically say it's only those 4. See if you can beat more than your friends! 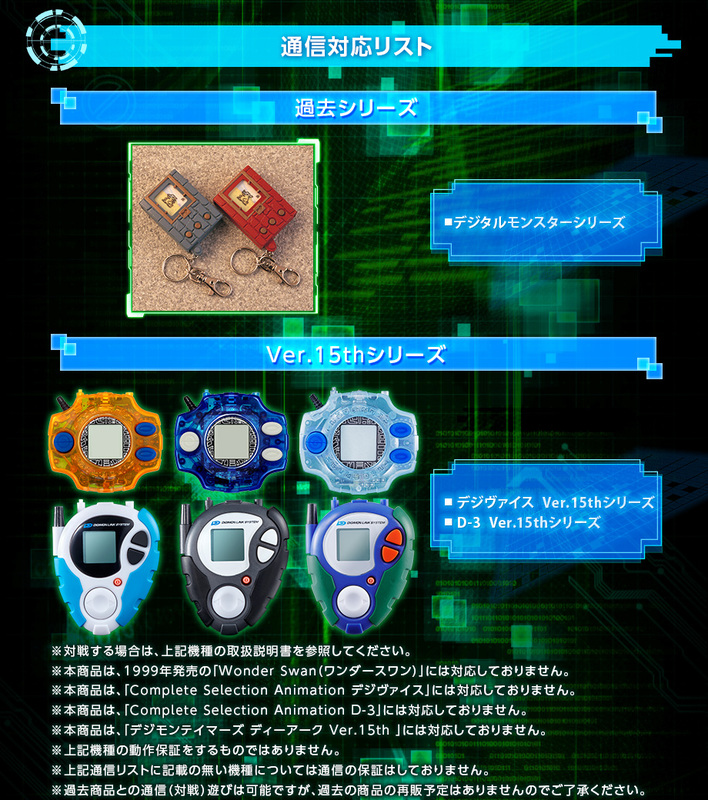 The original Digimon V-Pets work, the 15th Anniversary Digivice, and the 15th Anniversary D-3 all link to it. They mention if something isn't listed there is no guarantee if it will/won't work. In addition they mention that even if it does work, they will not be reselling old models. 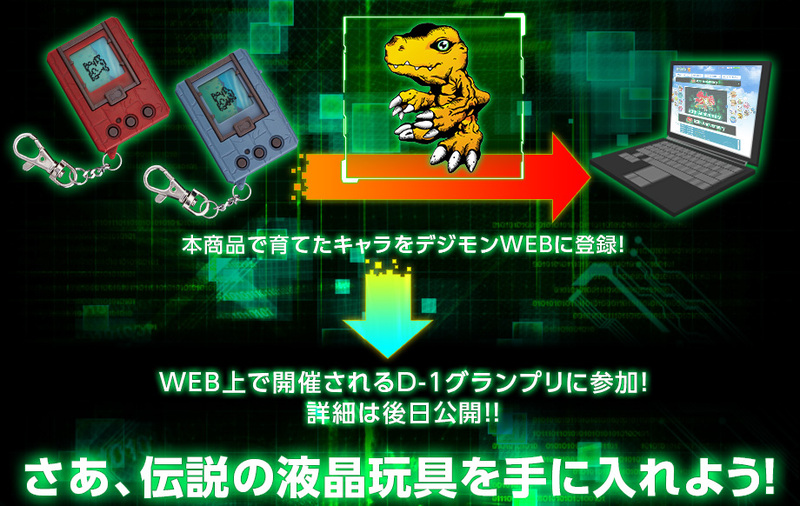 You'll also be able to register the Digimon you've raised on the internet. Then your Digimon will be able to compete in the return of the D-1 Grand Prix. This new version will be done over the internet and they will announce details later. Update- Dengeki has an additional bit of info that many people will find interesting. Each of the original V-Pet's had 14 Digimon... 5 of those... so 70 total. 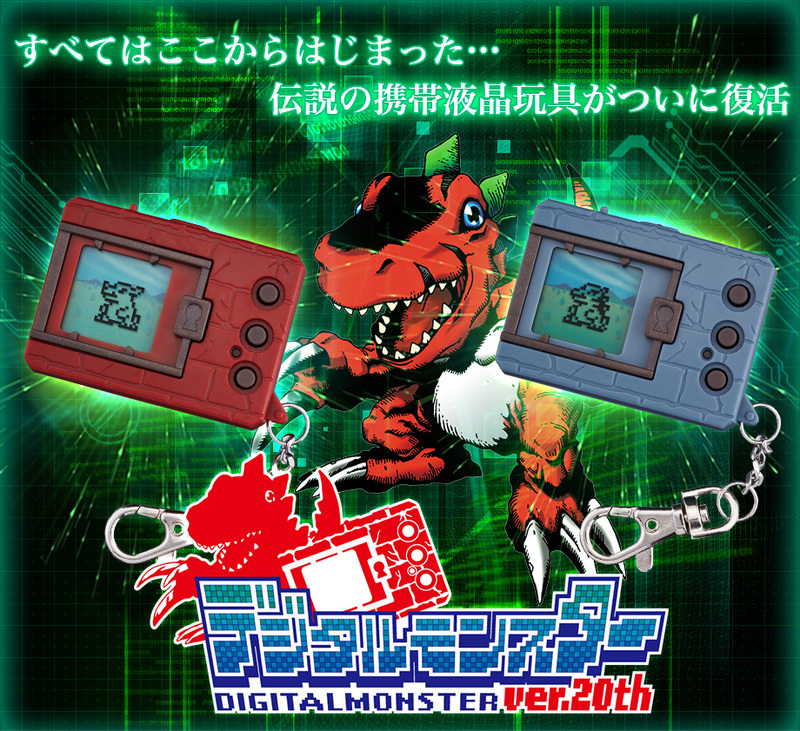 So 64 Digimon that weren't in the original V-Pet will be obtainable, nearly doubling the amount. Now, if you want to order a 20th V-Pet for yourself. Premium Bandai has them up for pre-order. They are 3,780 yen each. Pre-Orders close March 27th and they will ship in June. Update- The original pre-orders were closed early when Bandai sold out of what they planned to make awhile ago, but they've announced a second wave. They are using a new url for this second wave- Premium Bandai store. Thanks to shin for tons of translation help with this and garm for some touch up details. You'll want to provide your chosen intermediary with the link to the item. Just copy paste the links to the product pages for what you want and send them a message about it and they'll take care of it after they discuss pricing and their policies with you. The links embedded throughout the news article for the product items are exactly what you'll need to send them. 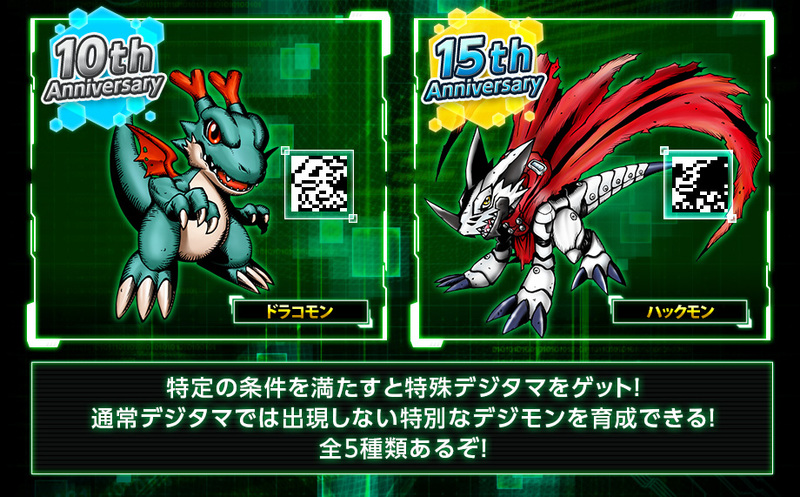 Previous 20th Anniversary Digimon V-Pet threads are here. Just a couple minutes left. We will update this news post as necessary. Update- As expected, it's finalized details for the 20th V-Pet. We are translating the various text and images right now and will update shortly. 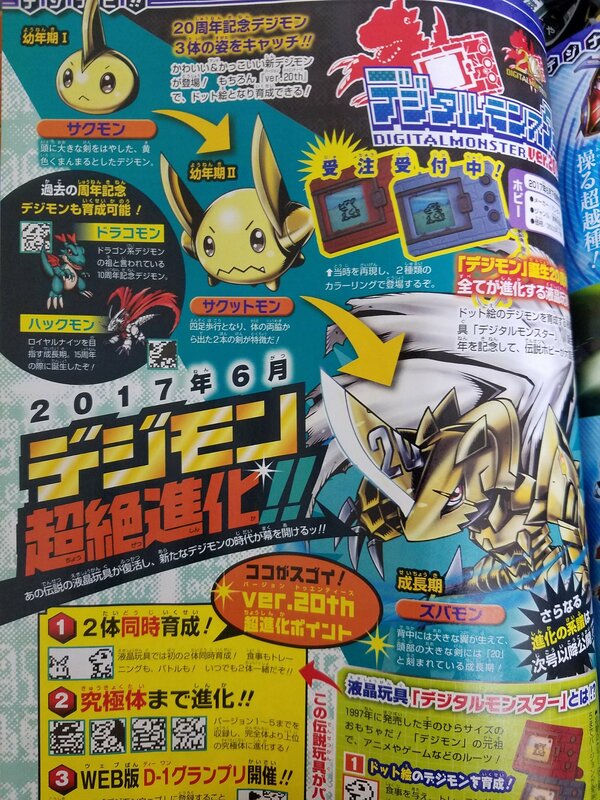 Update- Images of Zubamon's Baby 1 and Baby 2 forms from the new V-Jump. The Baby 1 is Sakumon: round, yellow Digimon with a large horn on its head. Thanks to Nightwing for the heads up and kimi_463 for the image. What name it is? 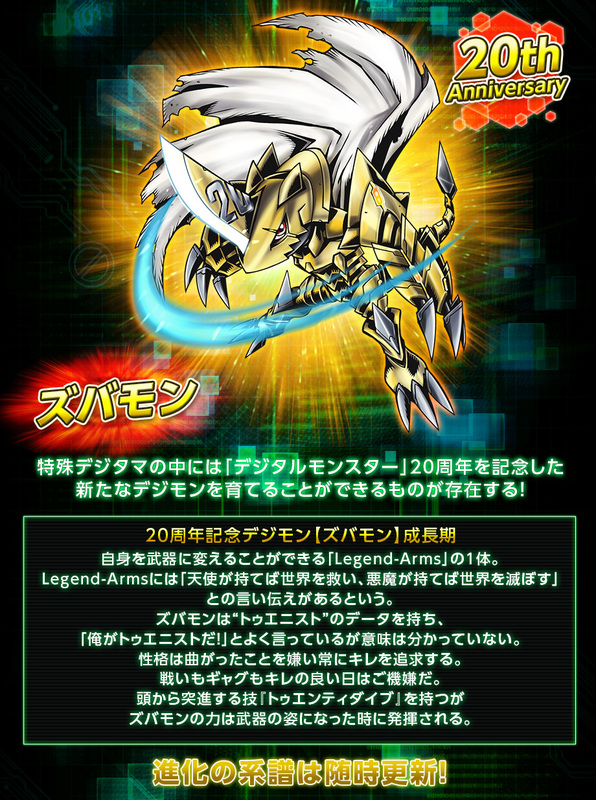 Zubamon? Yep, Zubamon's the name. A Child/Rookie level that kinda has an Appmon-ish look to it. I actually thought it was ​an Appmon before realizing that didn't make sense. That's what I'm getting as well. The funny part is, according to Google Translate, it literally translate to "spam". I don't know if that's a very accurate translation :P I did a search for "zuba" on Jisho.org and many of the results had to do with being straightforward, frank, outspoken, no hesitation, etc. Best I can thing of is S -> Z, P -> B. Love it!!! 8D Already messaged Buyee and hoping they respond relatively soon. Totally looking forward to this!